Jeré Reid is a woman of many titles and talents, all of which relate to her purpose of nurturing the mind, body and spirit. By day, she is a high school advance placement Government teacher. When she isn’t busy instructing her dozens of students, she is a motivational speaker, natural hair and beauty blogger. 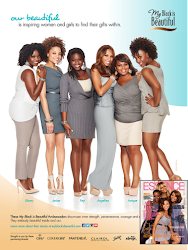 After a nationwide search, Jeré was chosen to be a My Black is Beautiful Ambassador. This Proctor & Gamble sponsored organization is designed to empower and motivate Black Women and young African American girls. 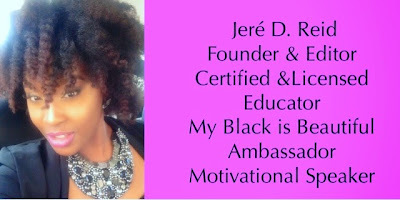 Through her work as an ambassador, Jeré has appeared in numerous publications including, O, The Oprah Magazine, EBONY, Essence, Uptown Magazine, and Sister to Sister. 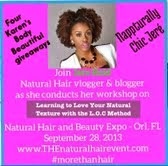 Through her website, Nappturally Chic Jeré, the beauty enthusiast fully embraces her passion of uplifting women and equipping them to realize their inner glow. This passion has allowed Jeré to mentor a number of young ladies and conduct workshops on natural hair care, self esteem, and empowerment throughout the United States and Canada. Jasmine Stephens is a licensed cosmetologist, healthy hair care specialist, budding educator, studying trichologist and is now the owner of MsJStyles™The Salon. As a child, she fed her passion for hair through pretend hair salons for Barbie’s and baby dolls. After graduating from the University of South Florida with a degree in Public Relations, she creatively found a way to merge her passion and degree, creating a business that caters to a growing market that is not only interested in healthy hair, but is also overtly concerned about the overall health of their scalp. In 2011 she began branding MsJStyles™, a hair care platform that aims to educate those seeking guidance on the science of hair and how to achieve healthier hair. In 2013, after taking notice of the increasing number of clients who decided to transition to natural hair following hair loss and scalp issues, she took her passion to another level and is now pursuing certification as a licensed trichologist. 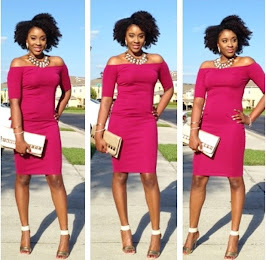 “I’m a self-proclaimed hair geek! Nothing fascinates me more than seeing and studying a piece of hair or the scalp under a microscope. Furthermore, I believe that healthy hair derives from a thorough understanding of the science of hair”. Today, Jasmine ceases every opportunity to educate, inform, empower and impart large doses of self-esteem to a community of women whose hair largely determines their perception of beauty. She volunteers her time to several projects and organizations throughout the Tampa Area to further promote healthy perceptions of beauty and to uplift young women. Professional makeup artist, licensed esthetician, and creator of "The Power of Color",makeup technique class, Mauria Smith possesses an impeccable eye and unfailing devotion to providing the perfect balance between elaborate, ornate makeup and a more classic, beauty look. With more than seven years in the industry working on a countless number of weddings, photo shoots, fashion shows, other special occasions, and even facilitating classes here in the states as well as abroad, she is dedicated to providing everyone with not only beautifully done makeup, but also the knowledge needed to flawlessly apply it themselves in addition to techniques to take care of their skin. 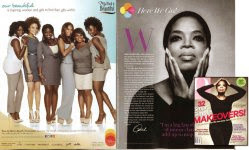 As a woman of color, Mauria is beyond committed to help change society's views, outlooks and positions on black women and other women of color in the beauty and makeup industry all while encouraging women as well as little girls to look past what is currently the status quo, and take great pride in their color and beauty. Giving others the knowledge and techniques they need to help build an unwavering self confidence is what matters to her above all else! Tamea, the fashion entrepreneur, knew she was destined for a career of greatness. Her personal style is seen as modern bohemian chic, she dresses how she feels with very few boundaries. She is not afraid to try new things when it comes to her wardrobe and loves that being natural also adds to her versatility. If she was to compare her style to a celebrity, it would be a cross between Solange and Kimora Lee Simmons. After graduating from Texas A&M University, playing basketball professionally and semi-professional she continued her education at the Fashion Institute of Design and Merchandising. During her tenure, she was able to partake in styling opportunities during Mercedes Benz Fashion Week and Los Angeles Fashion Week. Upon graduation from the Fashion Institute she assisted celebrity stylist in the L.A. area. Through those experiences she realized there was a need and a want, within the middle working class women, to be educated on finding wardrobe to fit their lifestyle, finding the celebrity look for less and most of all finding their own personal style. From there she started her own company, Styleyes Consulting, LLC, she specializes in closet therapy, personal shopping, shopping assistance, personal styling and cataloging. She is an accredited stylist, costumer, creative director and fashion coordinator along with IMDb credits. She has worked with celebrities such as, Loretta Divine, Lynn Whitfield, Rockmond Dunbar, Sharon Leal, Omari Hardwick, Essence Atkins, Jaleel White and Flex Washington just to name a few."